The CLP Regulation, Article 46, on Enforcement and Reporting, states that “Member States shall take all necessary measures, including maintaining a system of official controls, to ensure that substances and mixtures are not placed on the market, unless they have been classified, labelled, notified and packaged in accordance with this Regulation”. Urgent: to notify the classification and labeling elements to the classification and labeling inventory established by ECHA before 3 Jan 2011; ECHA has indicated in its FAQs that if you missed C&L notification deadline, you shall notify without any delay to avoid legal penalties. You can avail of our CLP notification service by using our application form. to provide Safety Data Sheets (SDS) and pass them along the supply chain and update SDS when necessary. "Something importers should know about C&L notification"
If you request your non-EU suppliers or the only representatives of your suppliers to submit C&L notification for your company, what they actually do is to create REACH-IT account for your company and submit C&L notification in the name of your company. Your company name will be on the submission report. " How can we assist you in complying with CLP? We provide end-to-end solutions to CLP compliance. 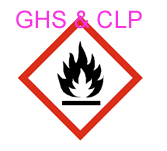 We can help you classify your substances and mixtures according to CLP, notify the classification and labeling of your products to the C&L Inventory, prepare CLP compliant labels and the latest Safety Data Sheets. Even though there are many guidance documents on how to prepare CLP compliant label, it is much easier and less time-consuming for you to outsource this job to us. CIRS a leading provider of comprehensive chemical compliance services for companies doing businesses in/with EU and China with a strong focus on chemical compliance. With a strong presence in EU and China, CIRS has provided cost-effective regulatory support to over 3,000 companies while doing businesses in both the EU and China. CIRS is a recommended service provider by China Inspection and Quarantine Bureau, the US Mission to the EU and IDA. CIRS is also a member of Helsinki REACH Centre.